Perhaps this is because it’s actually a dressing room, onto which we added a door, and into which we squeezed everything she needs. Until she grows out of her crib, that is, and has to have a grown-up cot and then heaven knows what we’ll do. But until that point, she’s in her little snug room and it’s very cosy. When we came to shopping for her nursery things, I have to admit to being shocked, and then somewhat appalled, at the quite insane prices for things that are, in effect, chests of drawers with four planks of wood nailed to the top, cots that were bigger and plusher than my own bed and various other bits of furniture that seemed to serve little more purpose than taking up space and being something else you could stub your toe on in the middle of the night. As parents-to-be you are a captive audience for the over-priced and over- marketed stuff that you somehow believe you MUST have. And then of course you have the baby and you realise that really all you needed was to love it, and do your best. And that everything else would just work itself out. And whether you had the Arlington changing table in white or walnut really wasn’t going to be the difference between being a good mother or a bad one. Anyway, after a lot of researching I decided I’d rather improvise where I could and have fun buying pretty storage baskets, blankets, things for her to play with and little details to make her nursery feel special and personal, rather than spending all our ‘baby-money’ on one piece of furniture. I am not joking here. 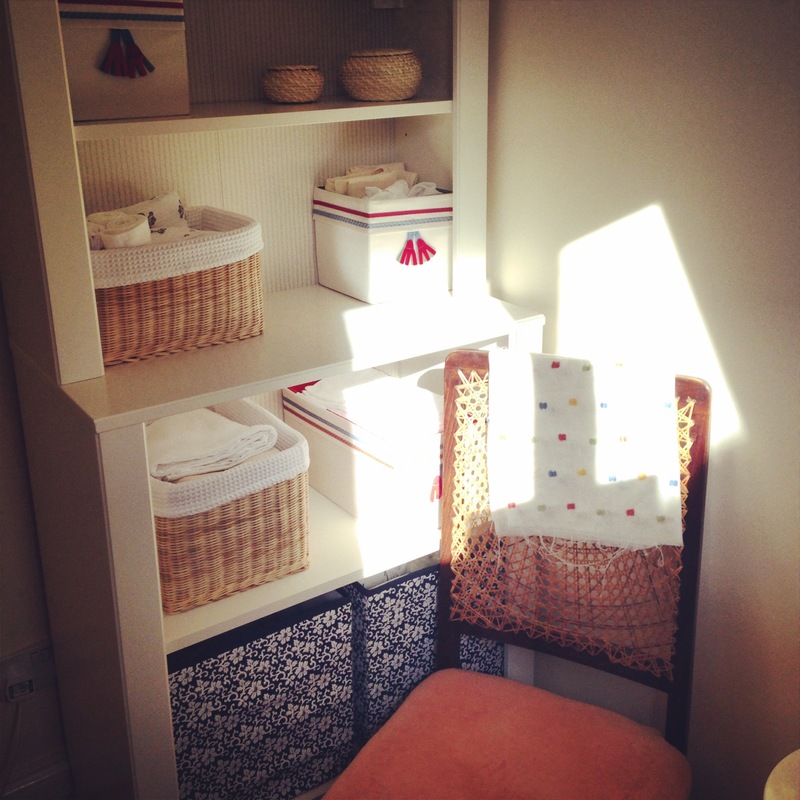 We budgeted around £500-600 to get all the baby stuff we needed – a changing table costs, on average, £450. So we bought the furniture we needed from Ikea. This sweet shelving unit which you can see left and this set of drawers below, left. 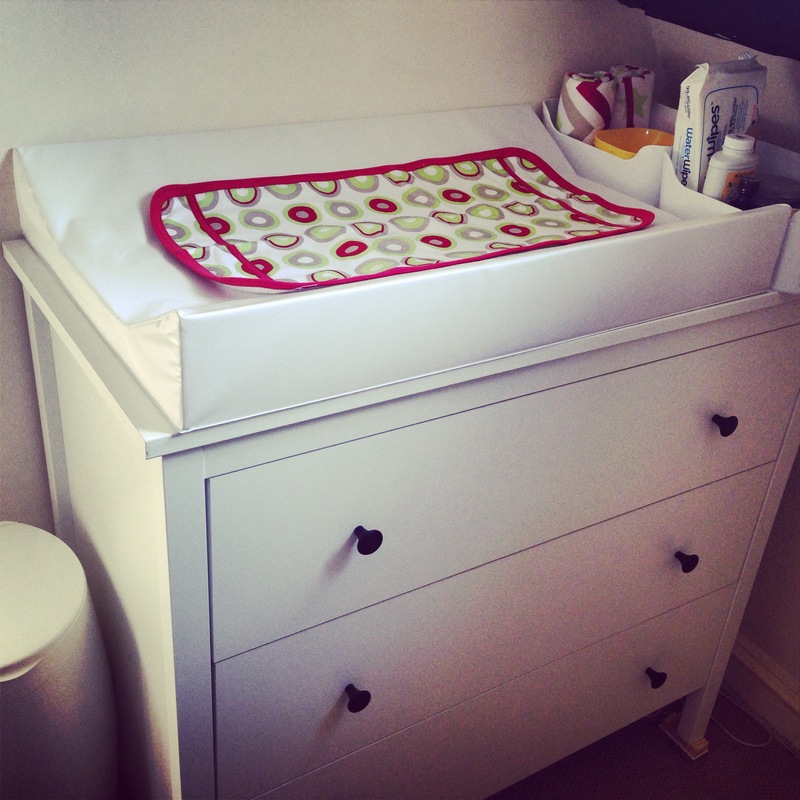 On top of the chest of drawers I put this scoop-sided changing mat from John Lewis, and a couple of white baskets from Ikea with towels, muslin, baby wipes and other faff in. The chair is a vintage chair I picked up from an antiques shop for £35. I used it for a couple of months but, as Munchkin got bigger, I realised I needed an armchair to support my tired arms when feeding her, so bought another antique chair for £60, oak with a tall back and wide comfy arms. I’m still using it now. Her cot is actually my cot that I slept in as a baby. We got a new mattress though, from the wonderful Little Green Sheep company, who make superb bespoke organic mattresses using natural products. We also purchased a couple of mattress covers, again in breathable organic fabric. I used this lovely bumper and blanket set from Mothercare to finish off her snoozy spot (yes, yes I know they’re not advised, but they make her bed soft and cosy and I’m sure it’s fine) and this divine blanket from The Little White Company. 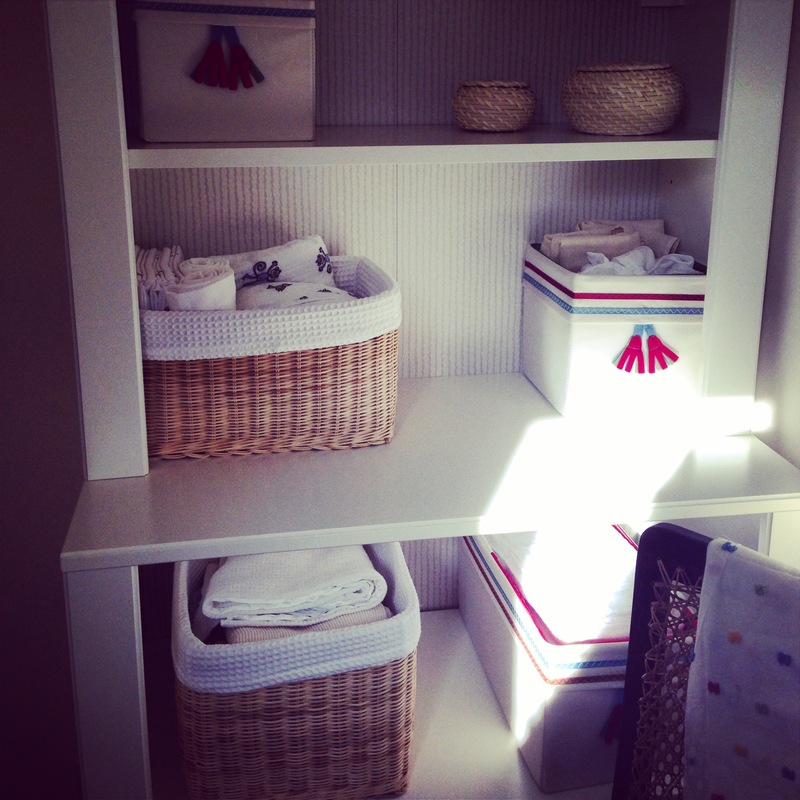 We got lots of great storage options from Ikea, including these green baskets, this gorgeous white nursery set, these blue and white fabric boxes and these handy wipe clean white tubs, which come in different sizes. I also bought this pricey-but-worth-it set of baskets from John Lewis, which I just love. Inside the chest of drawers I used drawer dividers to separate her tiny socks from her tiny vests, and this handy set comes in a variety of sizes so the storage space can grow as her socks and her vests get bigger. 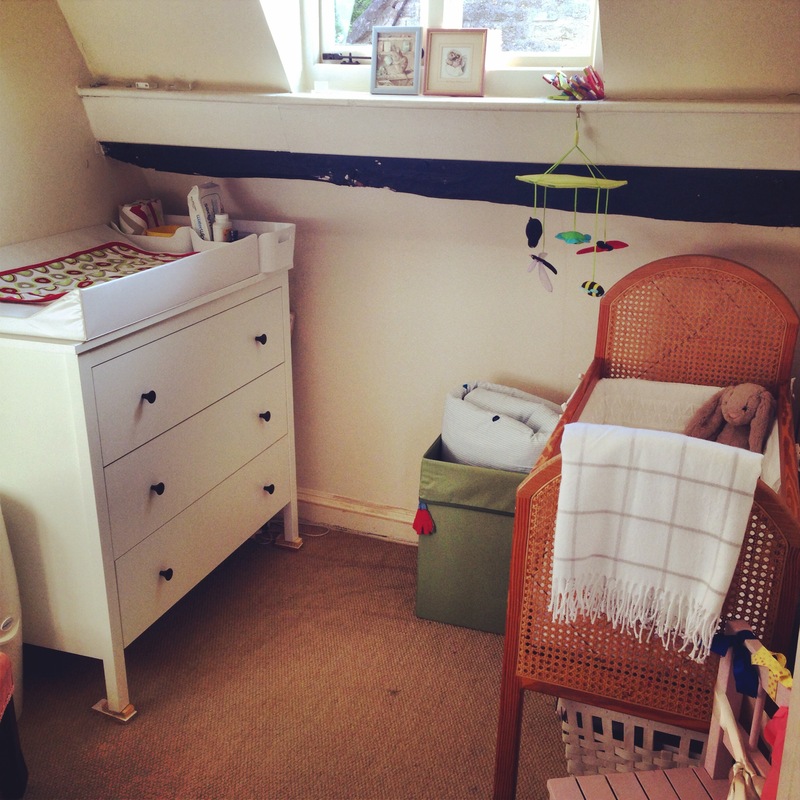 Her little room is just perfect for her at the moment, there’s plenty of storage space and it’s really flexible, which I love, because her needs and what needs storing where changes on a monthly basis. This means we can regularly have a sort out and there’s always somewhere to put things. A cosy, happy spot for my happy little soul.